Vormberichten, a magazine about design and entrepreneurship, is a magazine devoted to the field of design in all its creative and entrepreneurial aspects. 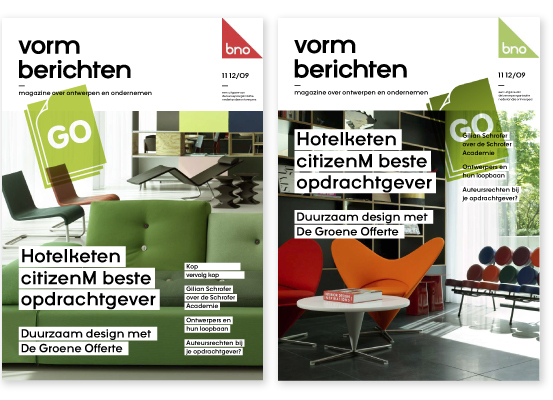 This in-house magazine of the BNO (Association of Dutch Designers) contains news and articles about the association, the profession, and the various design disciplines linked to the association. For two years I did the Art Direction of the magazine, and a few new additional design of content. In addition I did the Restyle of cover that appeared since january 2010. The redesign of the cover was needed to shift the appearance of the magazine from a solo ‘graphic design magazine’ to a ‘multi disciplinary magazine’ which rhymes more with the BNO, and thus the content of the magazine. In order to bring more of the disciplines to the surface I decided to bring the inside to the outside. The cover must tell what you can read about on the inside. The design gives room for two images, a photographic and an illustration, each representing a different discipline.